John Waddell, 60, told his friend that if he wasn't back home by Tuesday to search for him. He was found on Wednesday. 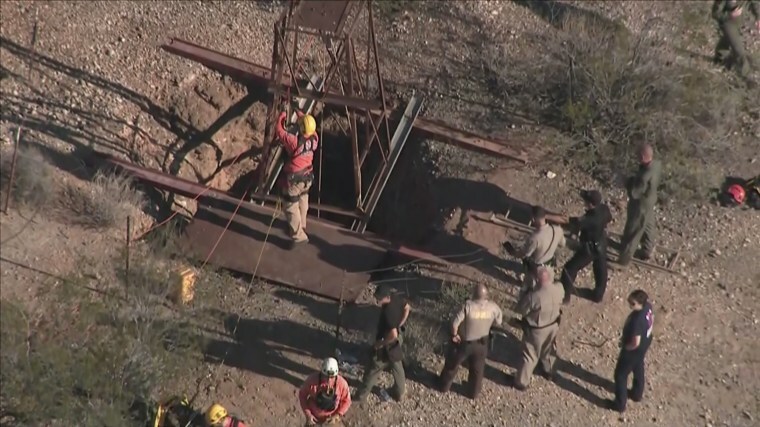 An Arizona man was searching for gold when he fell into a 100-foot-deep mine shaft in a remote desert area, sparking an hourslong rescue mission. John Waddell, 60, was pulled from the shaft on Wednesday night, two days after his carabiner clip broke, sending him tumbling 40 to 50 feet into the bottom of the mine. Terry Shrader said Waddell, a close friend, called him on Monday to say he was trekking out to the remote desert area near Aguila, about 90 miles northwest of Phoenix, to search for the precious metal. Authorities said Wednesday that Waddell owned the property and had worked it for 20 years. Shrader and Waddell had made a deal that if Waddell wasn't back by Tuesday, Shrader needed to search for him. Shrader told NBC News that he became worried when he still had not heard from Waddell on Wednesday. Luckily, he knew exactly where to find him. "Just as I pulled up in the truck, I could hear him hollering," Shrader said. Shrader said he found an area where he could get cellphone service and called 911. He then dropped water to Waddell as they waited for help. Waddell's dramatic rescue was recorded on video that shows rescue workers' using rope to pull him to safety. It took about five hours before Waddell was removed from the shaft. He was then flown to Banner-University Medical Center Phoenix with injuries that weren't considered life-threatening, Maricopa County Sheriff's Office Sgt. Joaquin Enriquez tweeted. "We are looking forward to his recovery. Great outcome today with all MCSO and law enforcement partners," he wrote. A hospital spokesperson told NBC News that Waddell broke his legs and underwent surgery on Thursday. "Mr. Waddell is happy to be with his loved ones and is looking forward to a successful recovery. The family has asked for privacy at this time," the spokesperson said. Shrader said Waddell told him he had to kill three rattlesnakes to keep them from biting him as he waited for someone to find him. "He's a tough guy," Shrader told NBC affiliate KPNX of Phoenix. "I've never seen anything like this. He's got both artificial knees. One of them was messed up pretty bad."